I’m at the supermarket, stuck, as if disabled, between tinned foods and Asian condiments. 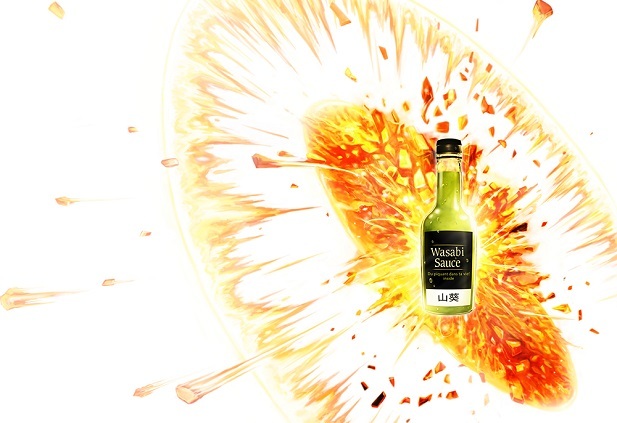 I’m desperately looking for a very particular wee green bottle: wasabi! No matter how painstakingly my searching eyes have scanned the shelves in front of me, centimetre by centimetre, enough to wear them out, it’s no use: I can’t see it! I am in the right section, though: it ought to be there!! Some shop-worker must have deliberately hidden it, for some dark, unmentionable reasons. I now look for a sales person (not sure if this is going to be any easier!)... I catch one, crouched down, excavating the shampoo section, with his right arm buried in the unexpected depths of a shelf. When I ask him if he’s the joker who’s hidden the wasabi, he gets up and, head down, charges towards ‘my’ section. With no effort at all, he stretches out his hand and extracts from it the little bottle of wasabi! Momentarily letting drop the impassive self-restraint of the salesperson, a faint smirk forms on his face. The small sneer is perceptible enough to make him slightly roll his eyes... Thinking I was about to be awarded a medal, as a righter of wrongs, for noting the disappearance of the prized product, there I was, left looking like a complete jerk. If I didn’t see it, there’s a good reason why: the item is now adorned with new packaging, which it didn’t have before! And my memory had an exact mental image of that bottle which did not correspond to the reality. In the end, it’s not the appearance of this darn bottle (oh yes, it is very appealing, blah blah blah) that interests me... but much more the taste of what it contains, OK?! Well, I’m pretty sure that He’s done it: think of my story about the wasabi... you need to accept that He’s different from what you imagine (even if your idea of the divine is very appealing)! Hmmmm... Wasabi, man, WASABI ! !